Veddw House Garden01291 650836work GardenA starred garden in The Good Garden Guide, Veddw has been admired by many over the years for its rich detail, idiosyncratic style and luscious setting. The garden is set in the wonderful countryside of the Welsh border above Tintern. 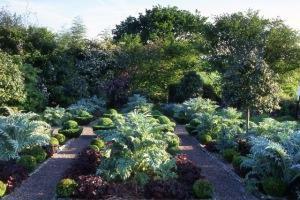 There are two acres of ornamental garden and two acres of woodland. A notable addition to the garden is the dramatic reflecting pool. The local landscape of rolling hills is reflected in the sinuous hedges that lead to the pool and provide the perfect backdrop for other planting schemes. Anne has a great interest in the history of the local landscape and has incorporated this into the garden design, in particular a large parterre of grasses in a pattern of box hedges based on the local Tithe Map of 1842. "My favourite NGS gardens include the Charles Jenks Garden of Cosmic Speculation and the Yew Wave garden at Veddw House in Wales." For more details, check out our http://veddw.com/. We have visitor information, visiting times, more pictures and everything you could want to know! "Anne and Charles have slowly built up an extraordinarily ambitious and idiosyncratic landscape." A starred garden in The Good Garden Guide, Veddw has been admired by many over the years for its rich detail, idiosyncratic style and luscious setting. Groups of 10 or more by appointment, afternoons and evenings during May, June, July, August and September £6.50 per person. From Devauden: leave B4293 on the St Arvans Road, signposted at village green.You will go down a steep hill, with Chepstow Park Wood on your right. After half a mile take left turn marked "The Fedw" - Veddw House is the first house on the right, with blue gates. Parking available for 12 cars on site.